It's taken the #1 spot as my most favoritest game ever ever. I'm going to have to break down and get the walkthrough guide, though. I simply do not have the free time to figure it all out. Like the previous version (The Elder Scrolls: Morrowind), this world is VAST. The NPC's are so much better in this game that I keep getting distracted by the townspeople and losing track of time. The textures are better, the monsters are smarter, the physics are amazing and the controllers are even upgraded! And I haven't even TOUCHED any of the online content yet. So, Oblivion is the new crack. At least the theme song for this version isn't quite as insidious as the Morrowind one. 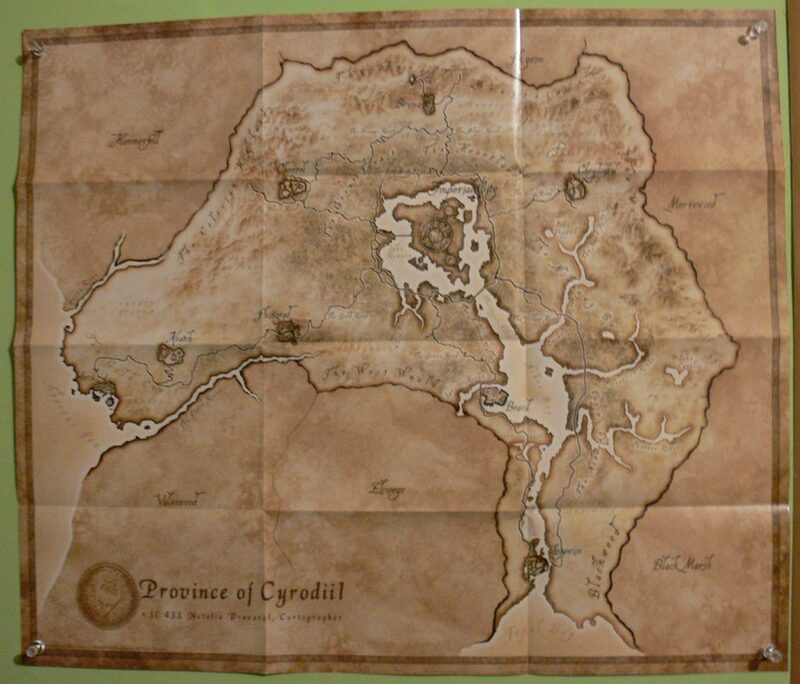 One small let-down is the fold-out map of Cyrodiil that comes with Oblivion (see map above). It's really just not as good as the Vvardenfell map included with Morrowind (below). I mean, really. Compare the two maps for a minute. Isn't the Oblivion map just...weak? Maybe it's just me, but this is a $60 game! I expect a friggin' awesome map! 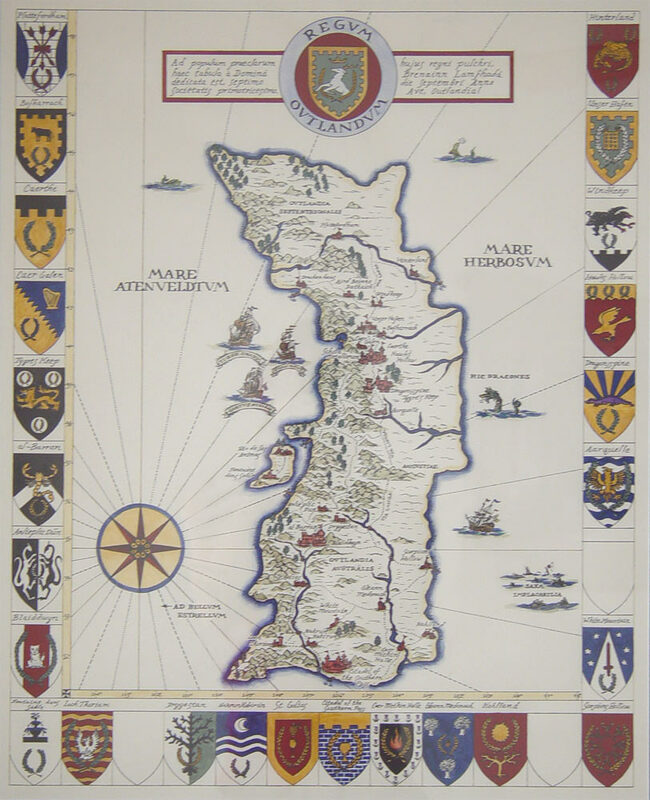 Elitist Cartographer that I am, I could have drawn a better map on my worst day. I mean, where's all the mountains? Trees? How about showing me where those pesky swamps are? And would it KILL you to use some COLOR?? Maybe the game creators blew all their budget on the physics engine. Ah, well. In other map news, remember that guy named E. Forbes Smiley who was caught stealing rare maps from various libraries? Well, he's going to be sentenced on September 27th. I hope they 'throw the book' at him. MORE map news? 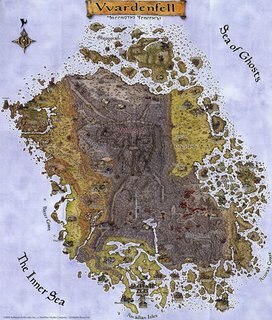 Well, for the RPG map freaks, I'd like to direct your attention to a section of the Wizards.com website called the Map-A-Week Archive. Never again shall ye want for a suitable map for adventurin'! Here's a fun GM prank: Print out a few random maps from the archive, and add your own treasure and trap notes. Let one or two of these maps casually 'fall out' of your stuff during your next game. One of your players (surely the Rogue) will distract you, whilst pilfering your 'notes' from your 'next adventure'. Make sure to talk up 'next week's quest' and all the research you are doing in preparation for the big day. At least one of the players will attempt to memorize where the traps and/or treasure locations are, but after you lead them into a abandoned mine instead of the Lich's Castle, the whole party will be totally lost! 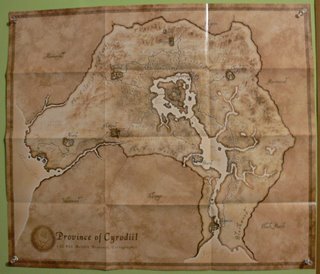 I actually like the colorless, parchment-like look of the Oblivion map... it makes the game more mysterious, and it seems more like the type of map a cartographer from Cyrodiil would draw. 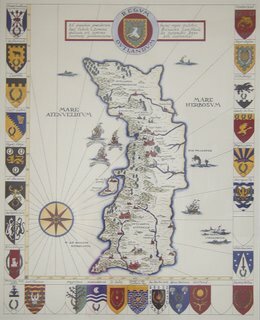 After all, how would someone have time to paint all the colors of the terrain on a piece of parchment?